I teach a Family Inventor’s Lab, a STEAM enrichment class for ages 2.5 – 7. We have designed the flow of the class so we begin with letting the children explore and discover on their own, making their own connections, and discovering their own questions before we give them any answers. After that, we talk about some big ideas, then send them to play with those ideas some more, then re-gather to share their conclusions. 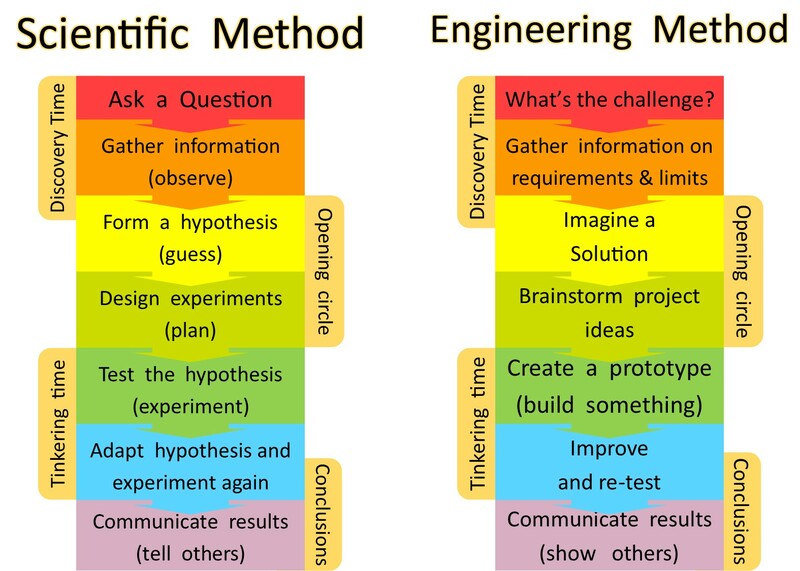 The maps above show the relation of this class structure to the scientific method and to an engineering process. Let’s look in more detail about how this works. Opening Circle: We then have an opening circle with all the kids combined (up to 24 kids, ages 2.5 to 7). We ask them to share what they’ve seen, we ask a few children to share what they have made. (During discovery time, the teachers watch for kids who are creating really good projects to illustrate some concepts – they ask those children if they will show their work during opening circle.) We ask them what they think the theme is and how the activities connect to it. After we’ve first grounded in what they’ve discovered, we introduce the key concepts of the day, and talk about the other activities we’re doing. Sometimes we’ll give them a challenge to work on during tinkering time. Tinkering Time: They return to the activities with fresh information and interpretation, and have 30 more minutes to explore more, tinker more, and test out ideas. Teachers encourage kids to test ideas, then adapt them a little, then test them again, to learn more about the topic. We also ask questions which extend learning. Conclusions Circle: In closing circle, we talk again about: what did you observe, what did you build, what did you test, what did you learn? We do more activities related to the theme, often including a book on the topic to wrap up the day’s concept. A few days after class, parents receive an email, which often has follow-up activities they can do at home, or pointers to this blog to learn about activity ideas we had but weren’t able to fit into class time or logistics. We find that beginning with hands-on discovery raises the children’s engagement. Kids are naturally curious, but this format specifically harnesses that curiosity as a learning tool. They arrive to the opening circle open and ready to learn more. If we started by “teaching” them, they wouldn’t learn as much. This entry was posted in For Educators, Inventors of Tomorrow series and tagged class structure, science education, STEM, teaching on November 1, 2015 by Janelle Durham.